In 1885, William Hesketh Lever, the son of a grocer from Bolton, became the first person to sell soap in prewrapped bars rather than slicing parts off a larger block kept in the shop. 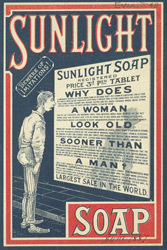 Lever's brand was ‘Sunlight Soap’, advertised here. So popular was it that Lever had to build a new factory in the Wirral to cope with demand. He felt it was important his employees lived and worked in pleasant surroundings and so built a model village in the Wirral, with gardens. a church and even an art gallery. With his brother James, William established the Lever Brothers firm, now known as Unilever.